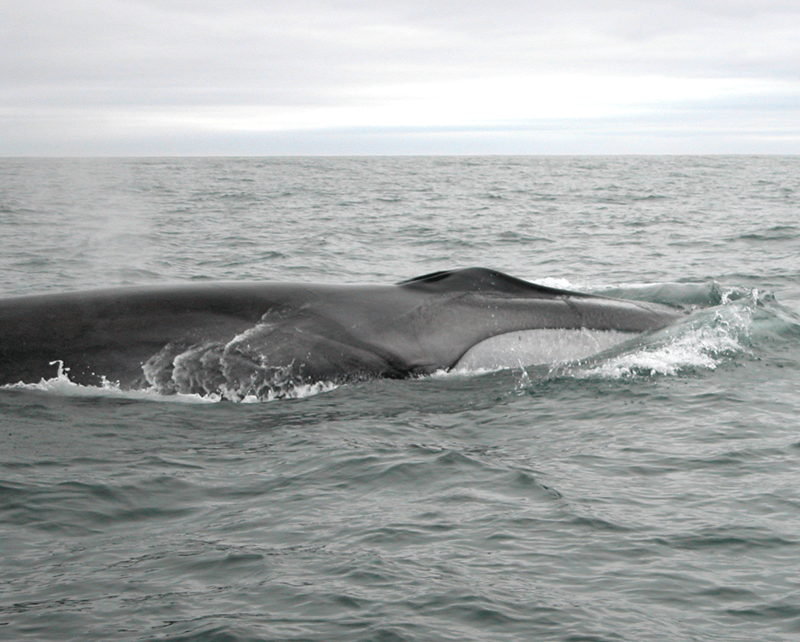 Fin whales are regular visitors to Ireland’s coastal waters and can sometimes be spotted from coastal promontories especially in the south west of the country. These spectacular animals are the second largest creatures on earth. With a maximum length of 24 metres (80 feet) and an estimated maximum weight approaching 80 tonnes, only the rarely encountered blue whale is larger. The fin whale’s body is long and streamlined. Its back and sides are a dark grey to brownish-black, while the underside of the belly, flippers and tail flukes are white. Between 50 and 100 throat grooves extend from the lower jaw back towards the naval. These grooves allow the throat to expand during feeding. The fin whale’s head, which makes up the first quarter of its body, is triangular in shape and flat on the upper surface. Its dorsal fin is about two-thirds of the way along its back, up to 60cm (24 inches) tall and curves backwards. It is one of the fastest of the great whales, capable of bursts of speed of around 23 mph (37 kph), earning it the nickname “greyhound of the sea”. 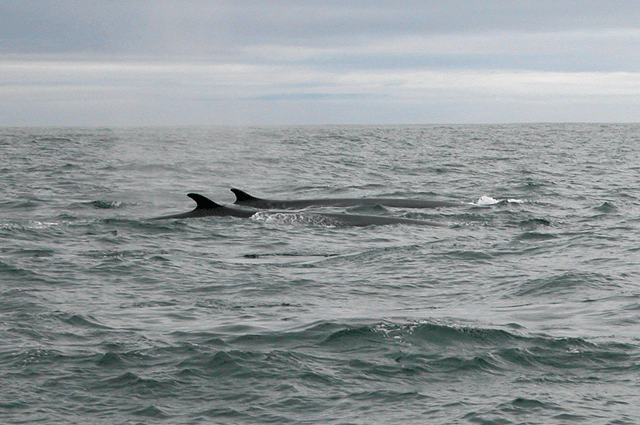 Fin whales belong to a group of cetaceans known collectively as baleen whales. Each side of the massive upper jaw sports between 260 and 480 baleen plates (or whalebones), each one measuring up to 76cm (30 inches) long and 30cm (12 inches) wide. During feeding the whale gulps a huge mouthful of water, the throat grooves expanding to accommodate the maximum possible volume. Then, as the mouth is forced shut excess water is forced out through the interlocking baleen plates, effectively trapping food inside. Considering their size fin whales consume surprisingly small prey. The particular prey taken varies according to geographical location and time of year but typically includes small shrimp-like crustaceans (such as krill and other similar species), tiny copepods and other zooplankton, squid and several species of schooling fish including cod and herring. Fin whales reach sexual maturity at 6-10 years of age. A single calf is born every 2 to 3 years after a gestation period of around 12 months. In the north east Atlantic calves are born between December and April and are 6 metres (20 foot) long at birth. They are fully weaned at 6-8 months old. Although they are seen individually, fin whales tend to be encountered in groups of between 3 to 10 animals, and sometimes in larger feeding groups. At the surface fin whales emit a robust blow that sends an inverse cone of spray up to 6 metres (20 feet) into the air. The blow is visible at quite a distance on a calm day. Fin whales dive to depths in excess of 200 metres (656 feet) but usually undertake a number of shallow dives, surfacing as many as ten times at 15-20 second intervals before taking a deeper “terminal” dive. This makes even small pods of fin whales quite easy to detect as they generate several explosive blows every minute. Fin whales live to around 90 years of age and have few natural predators, although there are records of adults being attacked by hunting groups of killer whales. Commercial whaling severely depleted fin whale numbers in both the northern and southern hemisphere, and they were still hunted commercially in some areas until as recently as the 1980s. The north Atlantic fin whale population today is thought to consist of between 35,000 and 50,000 animals.